Spring is the time that most reminds me of my mother. It’s not the fact that Mother’s Day is coming up in a few weeks, but rather the new life in my garden. Many of my plants were gifts from her. When my husband and I bought our house, she donated coral bells for the garden. 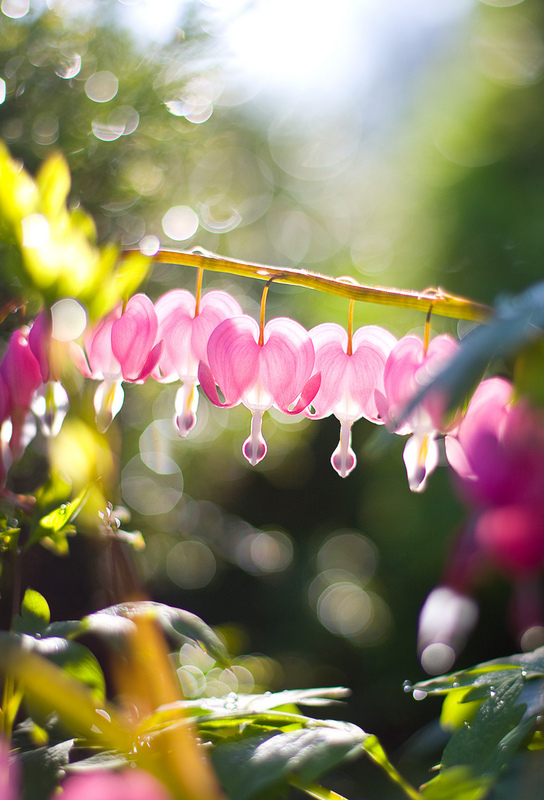 And when she died a number of years ago, we carefully lifted the bleeding hearts from her garden and brought it back to ours. Everytime I see that lovely plant, I am reminded of her and the time she spent tending it. 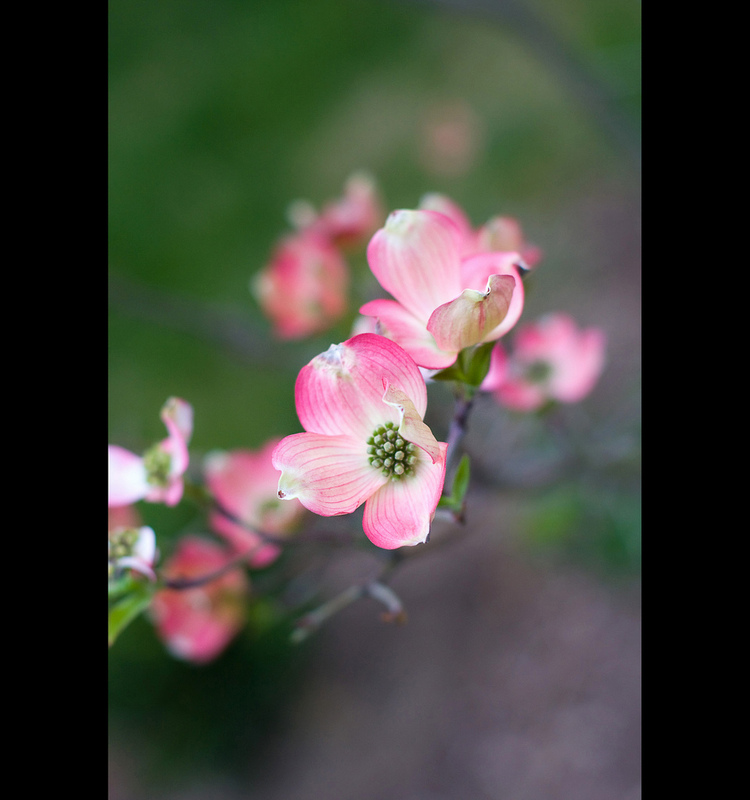 When I was growing up, we always had a pink dogwood in the backyard. Mom loved that tree and the beauty it beheld each spring. A couple of years ago, we added our own pink dogwood to our landscape. Just this year, it bloomed like never before; an explosion of blossoms. I like this photo of a small detail of the tree. I have a great photographic portrait of my mom in high school on my mantel at home, but her plants are a living reminder of the wonderful person she was to me and the rest of my family. 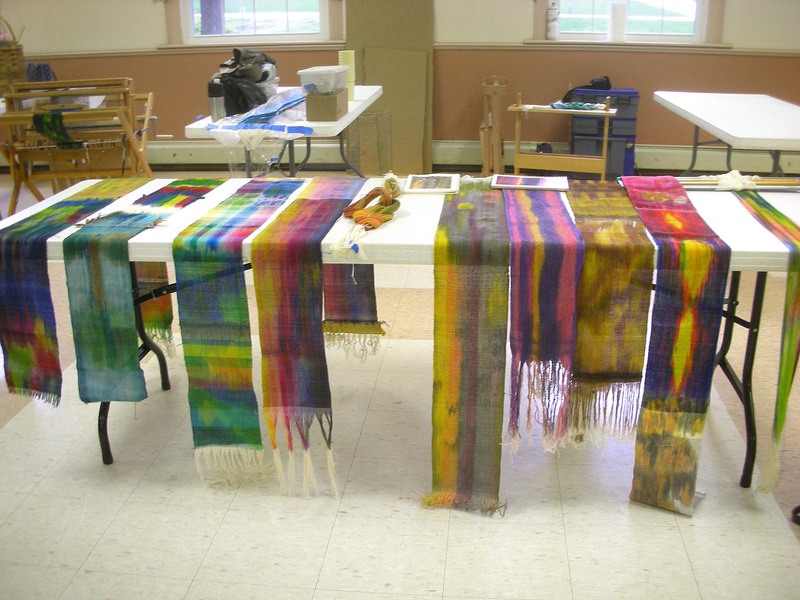 A couple of years ago I took a workshop with Liz Spear from the Asheville area on sewing with handwoven fabric. (There are so many good workshop leaders from Asheville). We picked out a pattern, made a practice muslin, wove several yards of cloth and came prepared to cut our beloved yardage and make a garment. Liz removed the fear, taught us some outstanding sewing techniques and we all finished wonderful pieces. Late last year, I finished another jacket. This time I wove yardage with a mix of colors and sizes of cotton threads. 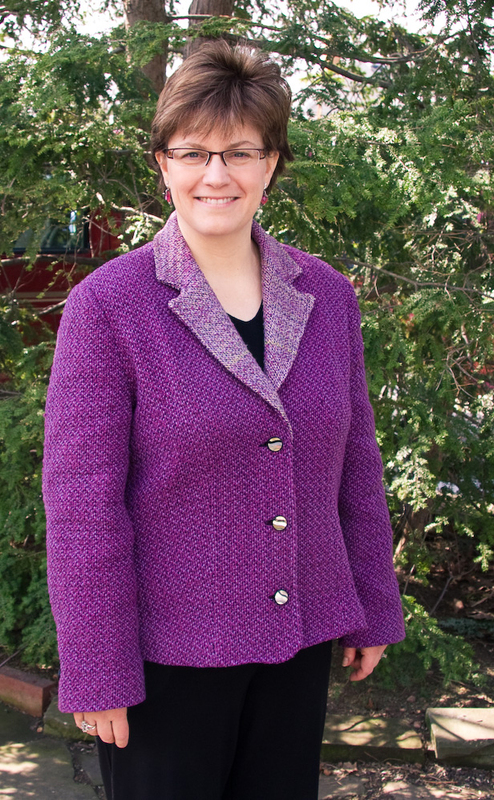 When I wore the jacket for Easter, I realized I had never posted pictures of it. Here I am modeling it in my garden on Easter Sunday. The contrasting collar is the result of weaving some of my tencel/silk/cotton handspun yarn into the yardage. The previous jacket I made was constructed of a wool/silk blend. With this cotton fabric, I learned that I had to be careful because the pieces can grow over time. So stabilizing the shape is critical. I’ve been sewing since I was a teenager, but I enjoy it more today because I can design the cloth on my loom. I’ve been fascinated by the concept of sacred geometry, the golden proportion, and the Fibonacci series. I don’t quite understand it, but would love to explore it further. When I saw this movie on YouTube, I was blown away by the way this artist so creatively illustrated it. I’m continually dumbfounded by the connection between math, nature, and creation. Life is too beautiful to have been a random set of events. 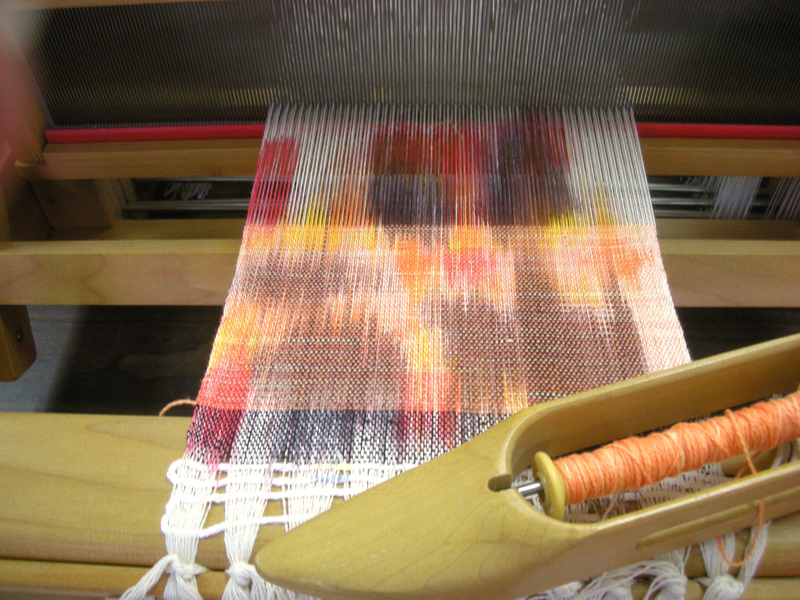 Over the weekend, I attended a wonderful weaving workshop led by weaving artist Kathie Roig. She presented Warp It, Paint It, Weave It, an exploration of painted warps both on and off the loom. Kathie was a terrific teacher–well organized, very informative, and most importantly for me, she was a lovely person. Our small group of nine loved her generous spirit. 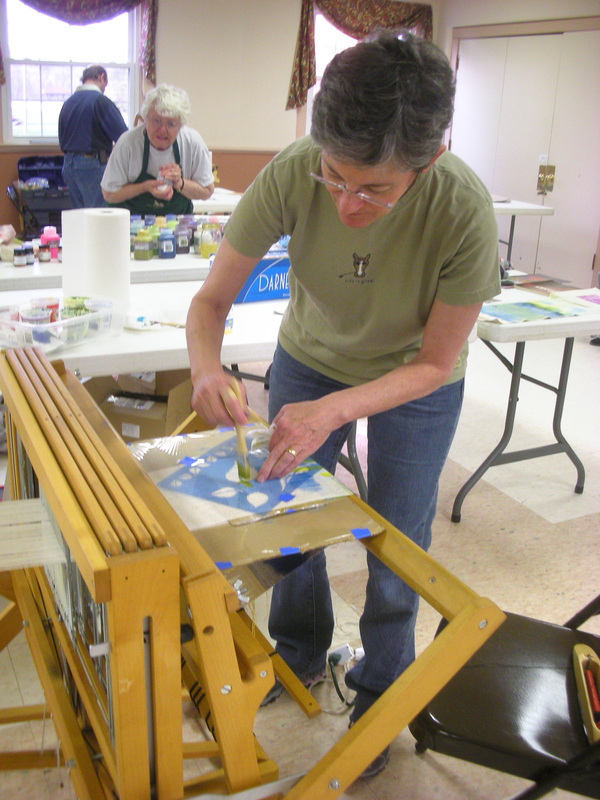 The first day was a half day session where she got us immediately into on-the-loom painting. We placed cardboard underneath the exposed warp, painted a design, dried it with a hair dryer and then proceeded to weave. This was one of my first attempts. I experimented throughout using different colors for the weft and the results were fairly dramatic. The first little bit used black weft while the rest is orange. Kathie did just enough demonstrating to give us the idea. Here she demos using stencils. The on loom painting continued through Friday morning. 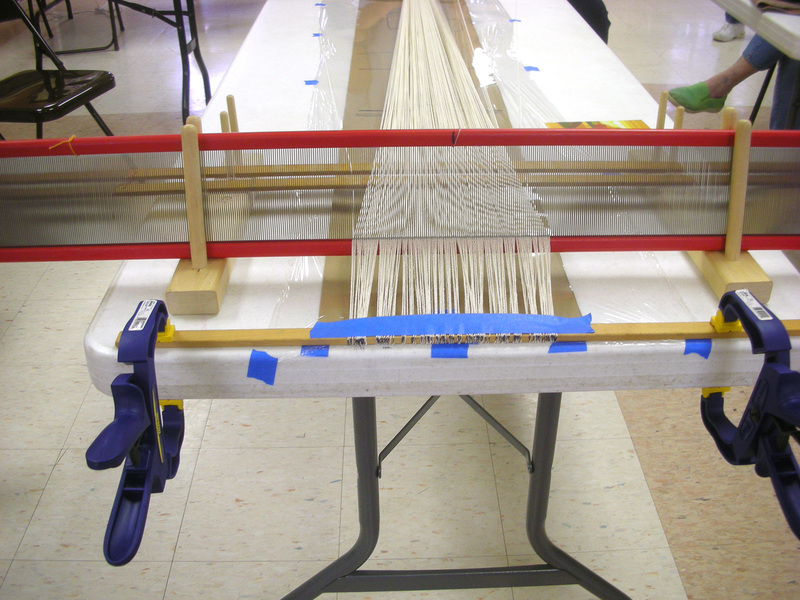 That afternoon she showed us how to to set up off-the-loom warps. This method really spread out the warp so you could paint your design. A cartoon was underneath to serve as a guide. By Saturday, many had woven both on and off loom samples. I work slowly so my unfinished warp is on the right. The pieces everyone wove were beautiful. We talked about how we would apply this technique to various projects and what we would change or keep the same. Kathie encouraged us every step of the way and made us realize how important it is to choose good quality leaders for workshop success. We all walked away quite satisfied. Maybe it’s because I’m a weaver and my husband is a photographer. But he notices things that point to my interest in how warp and weft interact. I think fiber, but he sees it in nature. One afternoon he came to me and pulled me out in the garden. “Doesn’t that look like weaving?” he said. It looked like a tangled mess. 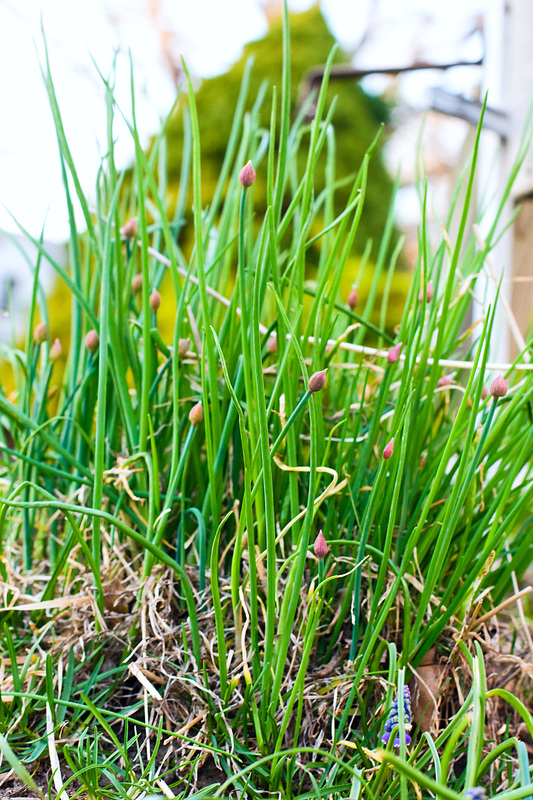 The chives were emerging into Spring to rise out of the dead waste from Winter’s slumber. But it occurred to me that it’s a lot like weaving projects. What looks like a mess at the beginning can often morph into something beautiful. Unlike weaving these chives will shed their weft and continue to grow their warp upward, but I’ll be searching for more examples of weaving in my garden from this point on. Bird’s nests come to mind. 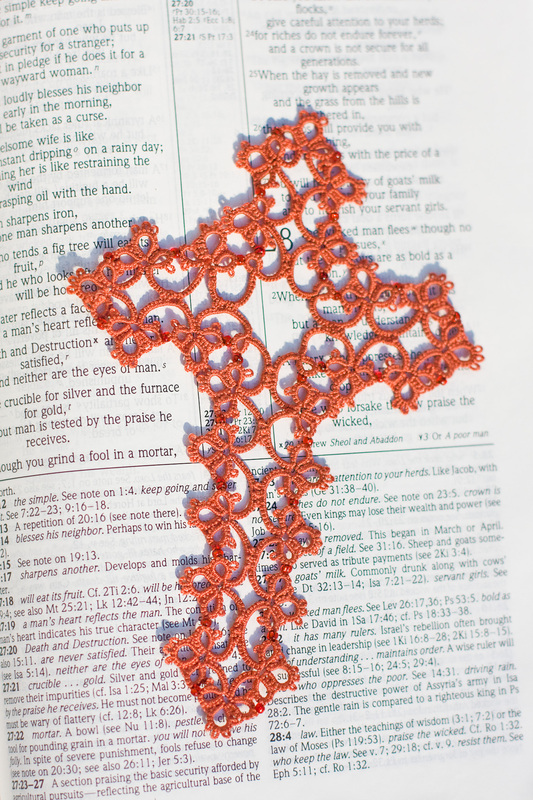 Tatting is one of those lovely lacemaking skills that takes an enormous amount of patience. Using a tatting shuttle and ball of thread requires finely tuned hand skills that sometimes get the best of me. Maybe that’s why I only tackle a tatting project when one of my sister’s seven kids goes through their first communion. So every other year I produce a tatted cross bookmark to mark the occasion. Here is the cross I just finished for my niece who is child number five. I started this on the plane to Italy last fall but stowed it away for a while. May is the month of first communions, so I had to get cracking to finish it in time to ship it to her in Georgia. 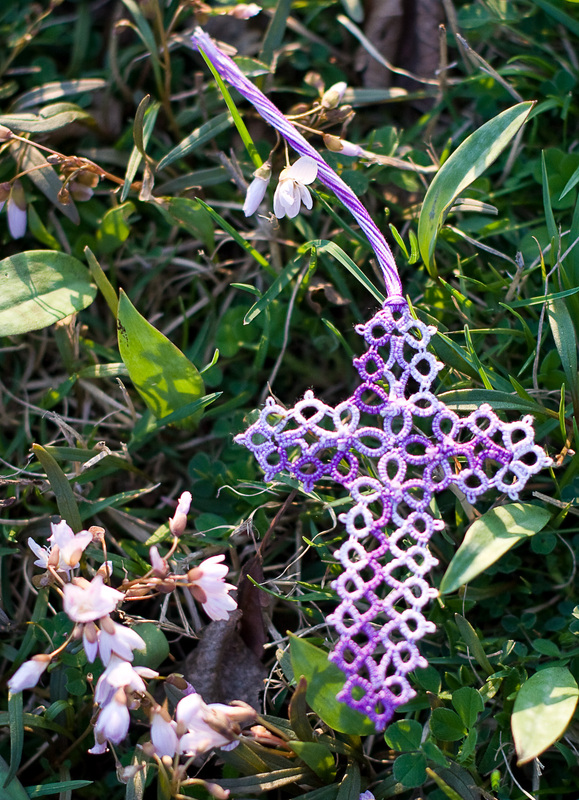 A couple of years ago, I wanted to try a tatted cross pattern with beads as an accent. I was pleased with this effort which has a prominent place on a display shelf in my living room. The beads are hard to see in the photo because they are very small and the color is very close to the color of the thread. I just wanted them to catch the light, not be the focus. I have two nephews left in the queue for tatted crosses, but I’m on hiatus until 2012. That should be enough time to get my fingers in shape again. I had fully planned on addressing other subjects today, but my eye caught this picture on my desktop and it just carried me away. Last fall, my husband and I traveled to Italy. 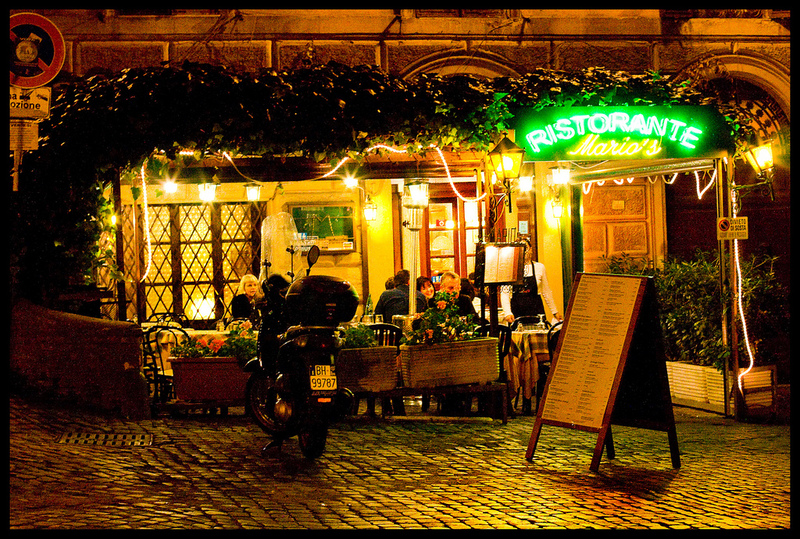 After we settled in a wonderful little European hotel in Rome, we started to explore the city for our first dinner. Walking down a narrow, little street dodging speeding motorcycles, we discovered Mario’s. It was as enchanting as it looks in the picture. That October night we sat outside, dining on Italian pasta and drinking wonderful local wine. Across the street, just a few feet away appeared the ruins of Trajan’s market. The magic of Rome is that in the midst of this very modern city, you can dine among the ruins of a culture thousands of years old. We saw some unimaginable sites during our trip to Rome, Florence, and Tuscany, but I will never forget Mario’s and the warm way we were treated that first night in Italy.